Whenever you create a file or folder, you can change who has access to it along with who owns it. While most users never utilize these features in Windows 7, it is beneficial to know not only how to take ownership of a file or folder but also how to grant access to what you create. From a security standpoint, knowing how to do both these tasks will greatly improve the protection of files and folders as well as knowing how they are vulnerable to prying eyes. Granting access to files or folders means you are allowing others to read, edit and work with what you have created. If you are worried about the security of your files and folders, this may be something you have to think carefully about before doing. 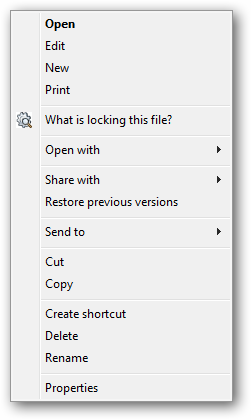 In order to grant access to a file or folder, you want to right-click it. 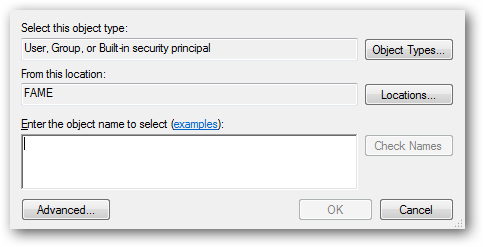 You want to click on the “Security” tab for your file or folder’s properties. This will open another security tab. You can see who has permission to access and work with the file. In this case, one user group and two users have permission to use the file or folder. If you click on Add, you can add a user or user groups to give them permission to work with the file or folder. If you do not need to add a user or group, you can change the permissions of each of the users or groups listed. Simply click on one. 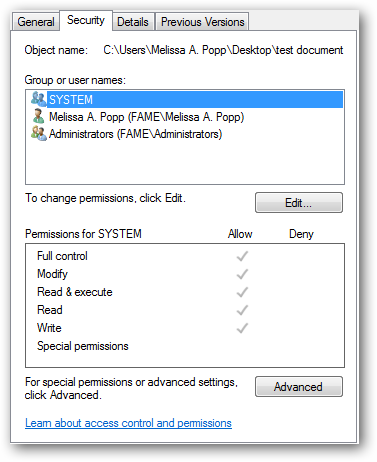 The permissions will be listed below with either an Allow or Deny column. You can choose to allow or deny each permission in the list. Simply click the box you want for each selection to change the permissions. This will bring up the more advanced settings for files and folders, such as Permissions, Auditing, Owner and Effective Permissions. 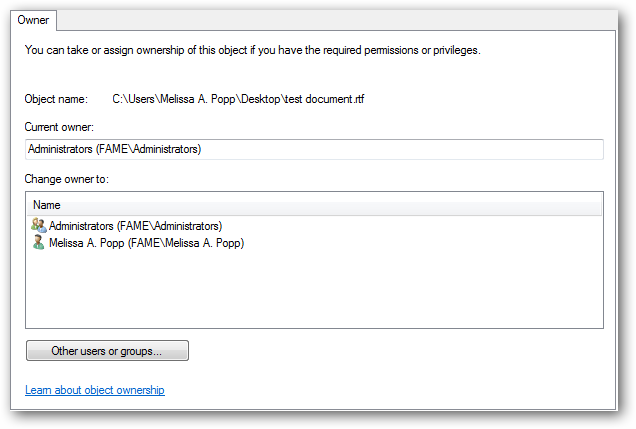 Permissions allow you to work with the permissions for a file or folder just like the way you just did. Auditing lets you change who can see what is going on with a file or folder that way you can check for any loopholes that may be occurring with a given document or folder. Owner allows you to change who actually owns the file or folder, and we will get into more detail with that in the next section. 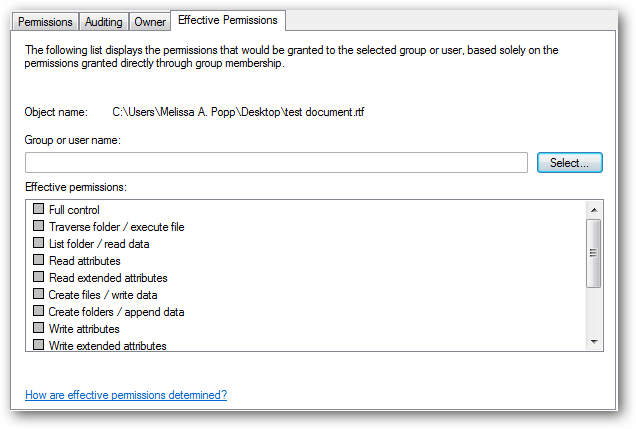 Effective Permissions gives you much more detailed control over what user or user group can do with a file or folder. These details include reading the properties, creating folders within folders, changing attributes and more. For each file or folder, you can choose its Effective Permissions as owner by clicking the box next to it. When grayed out, it means those permissions are active. These are all the ways you can change the permissions of a file or folder as the owner in Windows 7. Taking ownership of files and folders in Windows 7 is a bit of a myth. Only a user with sufficient administrative permissions can actually change the ownership of a file or folder, a regular user cannot just take ownership without administrative permission. If you have the right privileges, you can change the owner of a file or folder with little effort. If you want to take ownership of a file or folder in Windows 7, you can do so by logging on to your administrator account on your computer. Once logged in, follow the steps for opening a file or folder’s permissions and opened the Advanced settings. Now, click the “Owner” tab. The Owner tab allows you to take ownership of a file or folder if you have the right privileges to do so. You can also change who owns the file. 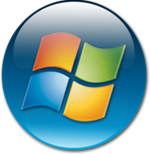 By default, Windows 7 will often assign a file or folder to and administrator for security purposes. As long as you log onto the administrator account, you can change the ownership to another account on your computer. You simply click on the user or user group to change the owner. From here, you have three options to choose from to create a new user or group: Object Types, Locations and Check Names. Object Types is the type of user or group you are creating. Leave this as is to make things easy. Locations allow you to choose anything networked to your computer to connect to in order to grant ownership. Simply choose the location on the network in this area. Check Names is actually the way you ensure the name of the owner you want to create is correct. When finished, click “Ok” to continue. You can now select the new user or group to give ownership privileges to. Once they are the owner of the file or folder they can change permissions or even hand over ownership. Between using ownership privileges and utilizing the right permissions for files and folders, you can keep what you work on safe and secure. 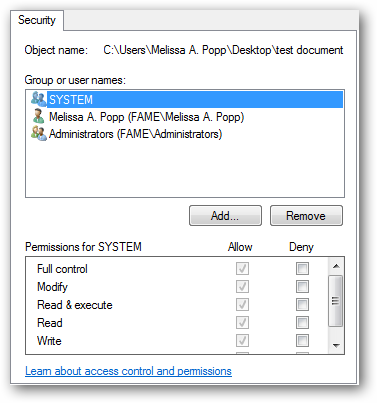 Why are ownership and access important in Windows 7? Many computer users, not just Windows 7 users, fail to realize all the ways their computers, operating systems, and everyday programs help with security. By understanding how access, ownership, and permissions work with each and every document, file, video, folder and more work, you can keep what you use when logged on your computer, secure, no matter the circumstance.